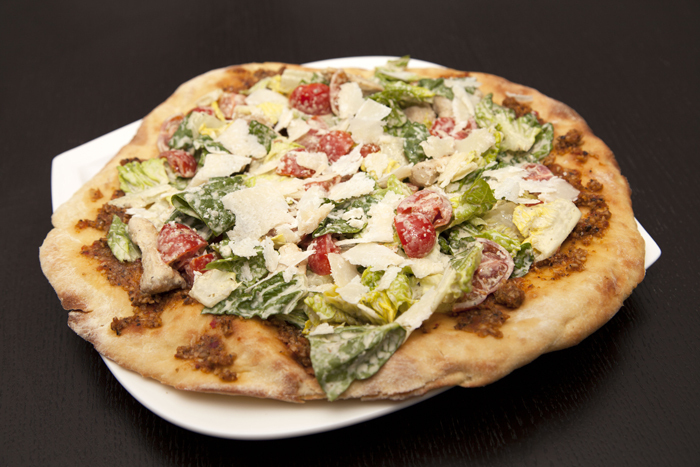 Recipe: Caesar Salad Pizza – Recipes. Simply delicious. 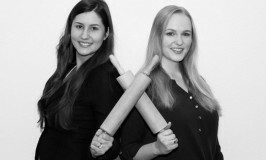 Looking for a tasty and healthy pizza? Well, now you’ve found it: caesar salad meets delicious, crispy pizza crust – a great combination that you just have to try out! Along with it comes an aromatic note from homemade Pesto Rosso – let yourself be surprised by the taste explosion. Click here for the tasty pizza crust recipe. With this recipe you can make a crust that tastes like it was made in a wood oven. If you want to make an easy Pesto Rosso yourself, you can find a recipe here. While the pizza crust is in the oven, prepare a classic Caesar Salad for your topping. For your salad, wash the lettuce and dry it in a strainer or salad spinner, then tear into bite size pieces. Wash the tomatoes and cut into quarters. Cut the chicken breast into small pieces and fry them in a pan with oil until they are golden brown and cooked through. Slice the Parmesan into fine shavings using a potato peeler. Boil the egg about a minute and a half, then briefly run it under cold water, and peel it. Now, mix the egg with the olive oil, capers, mustard, lemon juice, Tabasco and pepper. Peel the garlic clove and chop it into very fine pieces and mix into the dressing. The crust should be out of the oven by now and you can spread the Pesto Rosso evenly on it. 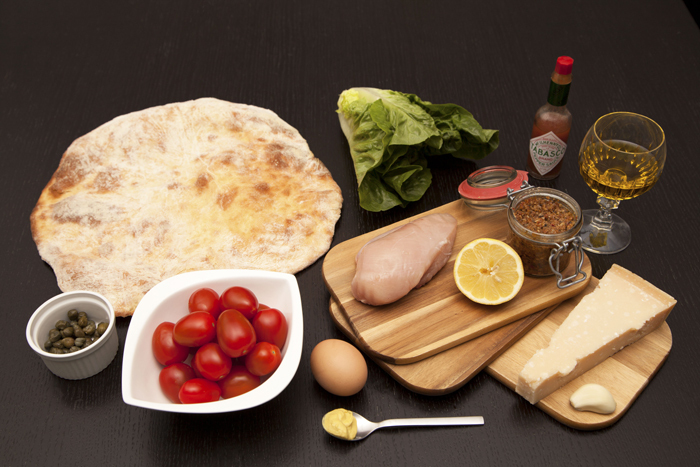 Toss together the lettuce, tomatoes, chicken and Parmesan in the salad dressing then place on the pizza. 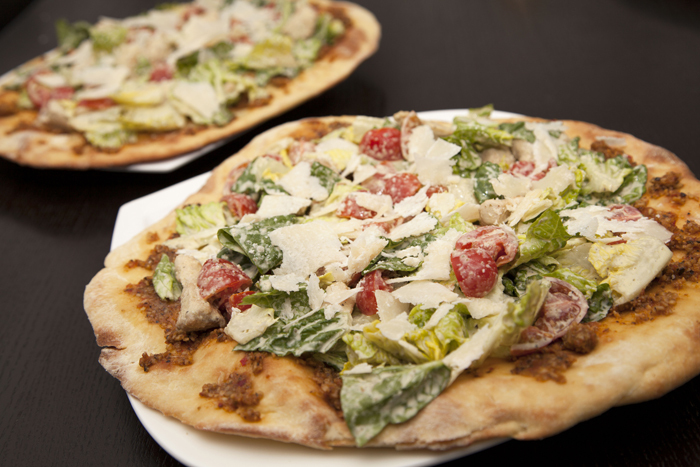 Now your Caesar Salad Pizzas are ready to be served – enjoy!